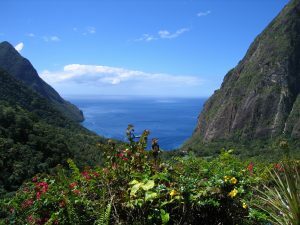 The Pitons — St Lucia UNESCO site! Probably the most popular tour for all visitors to St.Lucia is a trip south from Marigot Bay along the west coast of the Caribbean Sea going through the fishing villages of Anse La Raye, and Canaries to arrive at Souffriere with it’s many viewpoints of the world known Pitons, a UNESCO World Heritage Site. Gros Piton and Petit Piton rise directly out of the sea – conical shapes – and are two eroded remnants of lava domes. Quite outstanding to see and one of the most highly photographed spots on the island. There are a number of ways to do this trip – either by taxi tour with Smalley where you get to experience the Pitons plus lots of other sites along the way; by sailing along the coast south to Souffriere; on your own in rental car, or via water taxi. My favorite is always with a land taxi as there is more to experience along the way besides the Pitons; and you have a guide. It’s a full day tour so expect to leave the bay early and not return till late afternoon. Of course, if you’re more the athletic type, plan a hike to the top of Gros Piton (Petit Piton is much more difficult to hike). You must go with a guide and can find one quite easily as the base of the trailhead. The first half of the climb is fairly difficult so if you are having problems at the halfway point, it is advised that you not do the whole climb as the last half is much harder. You should start this hike early in the morning and bring along a lot of water. Cost is about US$30 pp but can change so be prepared for that. Reservations are not necessary. Photo Tip: And here’s an insider hint — when flying to the island, try to pick seats on the left side of the plane. Given that the flight that day can be along normal flight patterns, you will get great views of these two peaks from the plane!